When you have the flu, tiny drops with flu virus are in your coughs, sneezes, and the air you breathe out. These tiny drops are called droplets. Although these droplets carry live flu virus, they usually fall to the ground within 6 feet. That's why people who are within 6 feet of you can be exposed to the flu virus. That's also why people who are farther away are less likely to get ill.
Because you can't hold your breath until you are better, everything around you gets covered with droplets full of flu virus. Your pillow cases, your sheets, your covers, the table next to the bed, your towel, the phone, and of course... your hands! Other people who touch these things can get the flu virus on their hands. If they touch their nose, eyes, or mouth before they wash their hands, they may catch the flu. Some people with the flu have mild illnesses and some people are quite ill. However some people who get the flu are more likely to get very sick. People with high risk conditions can get very sick from the flu. Now that you know how seasonal and new (H1N1) flu spreads, we can discuss ways to keep from spreading the flu and how to care for someone with the flu. Because of your household circumstances, you may not be able to care for the sick person in an ideal fashion. However you should still follow as many of these steps as possible. If possible, put the sick person in a room that has an attached bathroom. Try to keep the door to that room closed. If there is no bedroom with an attached bathroom, use a bedroom without an attached bathroom. Keep the door to the bedroom closed. If a sick person has to be in a room with other people, try to keep everyone but the "caregiver" at least 6 feet away. NOTE: This means they should not go to work, school/daycare, church, or even the grocery store. It is especially important to keep sick people away from family members who are pregnant, are babies, and who have other high risk conditions. It's best not to have visitors come to your house. They could catch the flu! If the sick person must go to the pharmacy, they should use the drive-through window and tell the pharmacist that they are sick. That way the pharmacist will know to clean her hands after helping the sick person. If the sick person must go to the doctor's office, they should call ahead for instructions, and wear a surgical mask when they go in. cover your nose and mouth with a tissue when you cough or sneeze. If you don't have a tissue, cough or sneeze into the crook of your arm. drop used tissues directly into the trash, not on the floor. wash your hands often, especially after coughing or sneezing. You can use either soap and water or an alcohol-based hand cleaner. consider wearing a mask, particularly if you are taking care of a child. 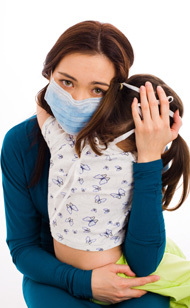 As you know, it is hard for a child to cover her coughs and sneezes. Wear a new mask each time you go into the same room as your "patient." When you leave the room, take it off and either drop it into the trash or into a hamper if it is washable. 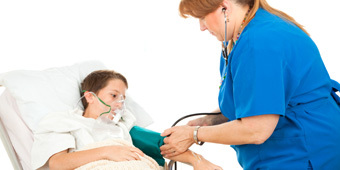 talk to your doctor about special precautions if you need to help the sick person with any breathing treatments. wash your hands after you leave the room. place your child's chin on your shoulder if you are holding him or her. That way, the child will be less likely to cough in your face. ask your doctor whether you should take an antiviral medicine such as Tamiflu or Relenza. CAUTION: if you are pregnant or you have a high risk condition and you are the only person available to take care of someone with the flu, you should. talk to your doctor right away about whether you should take an antiviral medicine such as Tamiflu or Relenza. wear a mask whenever you are in the same room as the sick person. should frequently clean your hands with soap and water or an alcohol-based hand cleaner. Hand washing is especially important after contact with the sick person or the person's room or bathroom. may wish to consider also wear a mask, especially if you are pregnant or have another high risk condition. drink clear fluids (such as water, broth, sports drinks, non-caffeinated teas, clear juices, electrolyte beverages for infants) to keep from getting dehydrated. 2. Make them more comfortable. 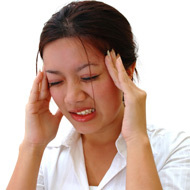 acetaminophen (Tylenol) or ibuprofen (Advil, Motrin, Nuprin) may be used for fever and aches. over-the-counter cold and flu medicines may help with cough and congestion. CAUTION: Check the ingredients on the package label to see if the medication contains acetaminophen or ibuprofen. You don't want to take double doses of acetaminophen or ibuprofen. 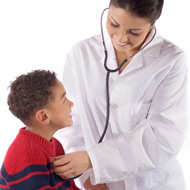 in children, how you treat fever, aches, cough, and congestion depends on your child's age. whether the sick person needs antiviral medicine. Although antiviral medicines are available to treat the flu, most people will fully recover without taking these prescription drugs. about any special care they might need if they are an infant, are pregnant, or have a high risk condition. Items like tissues, sheets, towels, clothing, and dishes used by the sick person probably have flu virus droplets on them. Clean your hands after handling these items. 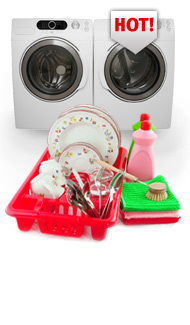 Wash bedding, towels, reusable face masks, and the sick person's clothing with your regular laundry. Use your regular laundry soap. Tumble dry on a hot setting. Wash dishes from the sick person's room with your other dishes. Wash them the same way you normally wash dishes. Throw used tissues and other disposable items into the trash. Dispose of trash from a sick person's room with your normal trash.